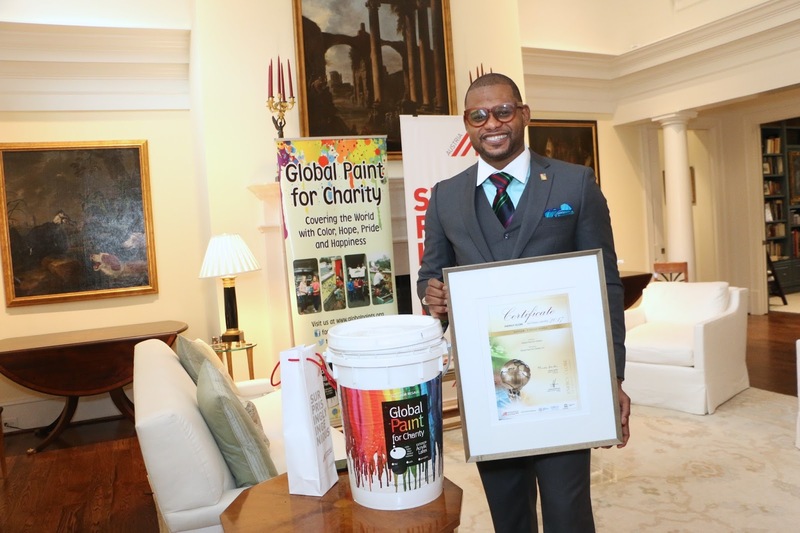 We are all so honored, humbled and delighted to announce that the Global Paint projects (Known as “Global Paint for Charity or “Global Paint“ or “GPC“) has won the 2017 national Energy Globe Award for United States for outstanding environment solutions. It is the largest and most renowned environmental prize worldwide. On June 5th, UN World Environment Day, the national winners of the Energy Globe Award were presented in a global online campaign under the patronage of UNESCO and in cooperation with UNEP. The Energy Globe Award includes 178 participating nations and over 2000 projects were submitted for the 5 categories of Earth, Fire, Water, Air, and Youth. The Energy Globe Award is presented annually to outstanding and sustainable projects in the area of environment and energy around the world. The Global Paint project was created to give each person in developing countries and right here in the United States, we serve the opportunity to enjoy the beauty of their shelter through every gallon of recycled paint. Through our efforts, We strive to protect the environment, change lives, and beautify and transform communities throughout the world. We are a non-profit organization in Atlanta, Georgia working together with commercial businesses and other non-profit organizations, residential households, and Paint Manufacturers to nationally recycle post-consumer Latex paint for our cause. Since 2010, we have collected more than 200,000 gallons of paint and redistributed more than 160,000 gallons to help with renovations and rejuvenation of family homes, homeless shelters, basic schools, churches, orphanages, and hospitals in targeted communities around the world and in many major cities in the U.S.
Our decisions today are responsible for determining the outcome of our planet in the future. With responsible recycling practices, we can ensure the reduction of resources, healthy ecosystems, and a healthier society. According to a source, 150 million gallons of paints end up as waste in The United States, United Kingdom, Canada and New Zealand combined every year. The U.S. EPA has found that paint can be a source water pollution- especially if it ends up in landfills. Improper paint disposal can have disastrous effects. One gallon of improperly disposed paint can pollute up to 250,000 gallons of drinking water, which can endanger species and destroy our fresh vegetables, fruits and drinking water. Meanwhile, The World Health Organization estimated that 1.5 billion seniors are living in very destitute homes and 3 million children die each year from diarrhea and bad germs on interior surfaces including unpainted walls and insanitary conditions, also mosquito viruses result in the deaths of more than 6 million people every year. Paint can protect against mold, bacteria and dangerous germs, the presence of which have a disproportionately negative effect on health outcomes in poorer communities. And paint can even be mixed with insecticide to stave off mosquitoes, which carry malaria and other viruses like Zika and yellow fever that kill more than 6 million people per year. All over the world we can see the immediate need to use colors to bring hope and happiness in poor communities. It’s estimated that 80 percent of the world’s homes and schools face the dreary reality of unpainted walls in the underprivileged communities, and more than 70 million children have never had access to a painted classroom. While there may be more pressing issues in developing countries than the facade of a wall, a classroom or a building, we believe that the right color in their rooms, and classrooms can truly change the ambiance and atmosphere of their environment and their attitudes. Thanks to our program success, we have donated paint for major projects in Liberia, Cameroon, Equatorial Guinea, Ghana, Kenya, Democratic Republic of Congo, Haiti, Salvador, Honduras, Guatemala, Mexico, Dominican Republic and Jamaica. Not only our projects help protect the environment, create jobs, brighten the future of those in need and spur creativity, but some projects also have a real health benefits in an age of uncertainty surrounding global outbreaks. Our framework places youth and minorities at the center of everything we do. We support small business owners, and create a Micro-finance program to help the underprivileged people to launch a small paint business and assist them to realize their dreams. Many thanks to the Energy Globe Foundation for this outstanding award, also thanks to our board members, volunteers, donors and friends who have been actively supporting and promoting our humble cause since it was launched in 2010 and have supported a variety of projects over the years. The main objective of GPC is to recycle unused paint and use it as a resource to help those in need around the world, we are protecting the environment and creating a brighter future for tomorrow. And for millions of children and their families, the paint is the gift of life, hope and happiness. Given the great success of Global Paint for Charity to date, we still have a lot more work to do to be able to bring colors, hope, unity, peace and happiness to many other regions around the world. While getting people to donate unwanted paint isn’t a problem at all but collecting, mixing, repackaging and shipping the paint is a huge hurdle. It's amazing how much can be achieved with just a small amount of money from people like you and a little help from the corporations and private firms. Your help will make a real difference to better livelihoods around the world and help eradicate the causes and effects of poverty and sanitation. Your donation can provide buckets for repackaging the paint, cover transportation and shipping costs, or life-changing opportunities like starting a small painting business training. With your help, we can change the world. Let’s work together this year to send gallons and buckets of hope into the world’s darkest shantytowns and slum cities.